Sighnaghi – Bodbe – Tsinandali Sighnaghi and its environs are home to several historical and cultural monuments. (located 2 kilometers from Bodbe Monastery). The town is walled with the remnants of 18th century fortifications. At the elevation of about 790 m above sea level, the town overlooks the Alazani valley and faces the Greater Caucasus Mountains. Bodbe Monastery is a Georgian Orthodox monastic complex. Originally built in the 9th century. The monastery now functions as a nunnery and is one of the major pilgrims sites in Georgia, due to its association with St. Nino, the 4th-century female evangelist of Georgians, whose relics are shrined there. Tsinandali - Alexander Chavchavadze House Museum Tsinandali is a village in the Kakheti region of Eastern Georgia, noted for the estate and its historic winery which once belonged to the 19th-century aristocratic poet Alexander Chavchavadze. There is kept a unique collection of wine from many countries. Familiar with European ways, Chavchavadze built Georgia’s oldest and largest winery where he combined European and centuries-long Georgian winemaking traditions. The highly regarded dry white Tsinandali is still produced there. Overnight in Televi. 1 day Mtskheta-Ananuri –Kazbegi Mtskheta one of the oldest cities of the country of Georgia, was capital of the early Georgian kingdom of Iberia during the 3rd century BC - 5th century AD and it was the site of early Christian activity. Svetitskhoveli Cathedral (11th century) and Jvari Monastery (6th century) in Mtskheta are among the most significant monuments of Georgia architecture, and are historically significant in the development of medieval architecture throughout the Caucasus. Tour along hiostorical Georgian Military Road. Visit Ananuri (17th century) is a castle complex on the Aragvi River. Drive to Gudauri. - is a ski resort (2000 meters above the sea level) located on the southern slopes of The greater Caucasus Mountain Range in Georgia. 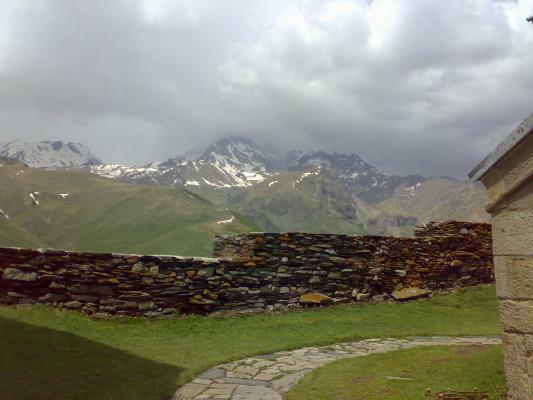 Drive to kazbegi – by crossing the “Jvari Pass” (2395 m. above the sea level) . Explore the area – the beautifully situated on the hill. Hire 4X4 vehicles to get to Gergeti Holy Trinity Church is a remarkable monument of Georgian architecture, near the village of Gergeti, situated at an elevation of 2170 meters, under Mount Kazbegi (elevation 5033). Drive to Darial Gorge, located at the east of Mount kazbek, pierced by the river Terek. Overnight in kazbegi.